The results are in for FY18 product and project director slating: The Talent Management Board of Directors approved eight product director positions and five project director positions; all selectees are scheduled to report in the spring or summer of 2018. The product and project director’s board is a civilian-only centrally selected board and is one of the major talent management initiatives outlined by the leadership of the Office of the Assistant Secretary of the Army for Acquisition, Logistics and Technology, providing an opportunity to select high-performing civilians with leadership potential at the GS-14/15 (or broadband equivalent) level. A complete listing of the FY18 selections is available on the Army DACM Office website. NEW GUIDANCE: Product and project manager and director: Civilians will no longer have a regional preference if they have already served once as a product or project manager or a product or project director while a civilian. Those individuals will still be required to submit a 1-N form; however, each best-qualified position must be listed with a number preference. If selected, the slating process still will try to accommodate civilians regionally. Any declination by a civilian in this circumstance would be with prejudice, and that individual would be ineligible to compete again at this level. The Army DACM Office will advocate for the Army Acquisition Workforce (AAW) at the OSD Small Business Forum and brief the associate directors of the Army commands’ Small Business Programs on the following: the Army DACM Office; Defense Acquisition Workforce Development Fund (DAWDF) requirements and requests; frequently asked questions and standard operating procedures for Defense Acquisition University (DAU) Small Business Professional courses for Army attendees; insight regarding Army DACM Office priority for scheduling a DAU resident course. It’s not too late to submit your DAWDF requirements. The Army released the announcement for submission requirements for the FY19 data call for DAWDF on Feb. 6, and submissions are due by May 18. The FY19 DAWDF priorities are aligned with our AAW Human Capital Strategic Plan goals, and are focused on continuing to build a quality, professional, agile and adaptive AAW and sustaining the AAW’s professionalism. Are you a future acquisition leader? Inspiring and Developing Excellence in Acquisition Leaders (IDEAL), a leader development program for acquisition professionals at GS-12/13 (and broadband equivalents), is open for applications through April 26. 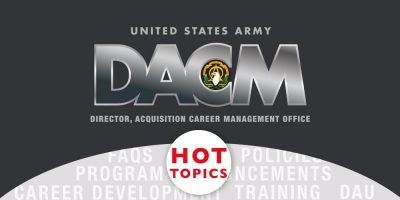 For more information, go to https://asc.army.mil/web/career-development/programs/inspiring-and-developing-excellence-in-acquisition-leaders-ideal/. Less than 45 days to apply! The Army Senior Enterprise Talent Management (SETM) and Enterprise Talent Management (ETM) Program application window for the FY19-20 cohort will remain open until May 15. Look across your organizations for the top talent and urge them apply. Army civilians must apply via the SETM/ETM automated system at https://www.csldo.army.mil/. Your point of contact within the U.S. Army Acquisition Support Center is Joyce Junior, at joyce.b.junior.civ@mail.mil or 703-664-5684. Also part of that education initiative is the new Systems and Program Management Non-Resident Master’s Degree Program. Applications for this opportunity must be received by May 10. This interdisciplinary program combines systems engineering with program management to broaden the technical capabilities of acquisition workforce members with non-technical backgrounds and provide the tools to successfully manage and lead programs and projects. For more information on this program, NPS Program No. 722, go to https://asc.army.mil/web/career-development/programs/naval-postgraduate-school-master-of-science-in-systems-and-program-management/ or contact Uhura Smith at uhura.n.smith.civ. @mail.mil or 703-664-5732. The Systems Engineering Non-Resident Master’s Degree Program, with a system of systems focus, is a two-year engineering degree program accredited by the Accreditation Board for Engineering and Technology and designed to address a wide range of systems engineering and integration challenges. For more information and program requirements for this opportunity, NPS Program No. 311, go to https://asc.army.mil/web/career-development/programs/naval-postgrad-ms-sys-eng/ or contact Uhura Smith at uhura.n.smith.civ. @mail.mil or 703-664-5732. Need more help? 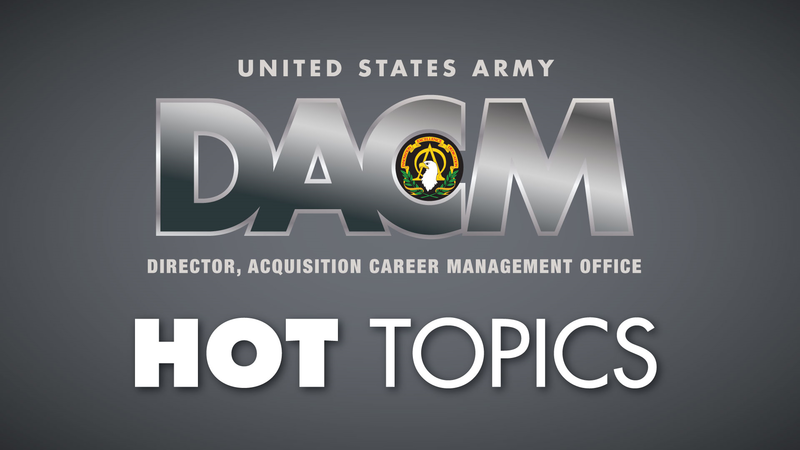 Want to know more about a program or opportunity offered by the Army DACM Office? OAPs or AAW members can submit a CAMP Help Request ticket, and we’ll be happy to get you what you need. Spread the word! You can get all the newest career and workforce information mailed straight to your inbox. Go to https://asc.army.mil/web/news-november-hot-topics/ and subscribe at the bottom of the page.